As if to back up the point from the previous page, here is Capcoms Resident Evil 5. A game that both looks good and performs admirably on even a low-end gaming PC. As this has both DX9 and DX10 modes we thought we'd run both in both modes to see how well these cards handle the older DirectX framework that still makes up the large proportion of games you own and use. Although all the cards on show can happily break 60FPS this is one of the few games that doesn't include tessellation or PhysX in some capacity and so is a purer test of raw horsepower. It's clear that the latest Radeons have an advantage here with the humble HD6850 being 20 and 10 frames per second ahead of the small and large GTX460s respectively. 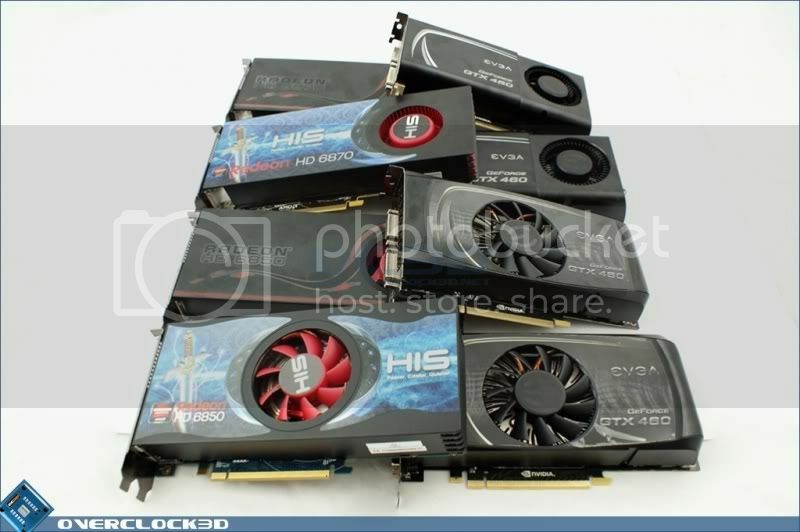 When overclocked the GTX460 1GB regains a lot of the ground it lost at stock to be neck and neck with the HD6850. The 768MB GTX460 is clearly suffering from the smaller memory capacity and still lags behind. With two cards in place both solutions even themselves out with only a couple of frames between the two Radeons and barely a gnats chuff between the two GTX460s. Easily the oddest thing is the minimum frame-rate. It is very rare we see them almost the inverse of what we'd expected. The HD6850 in the right scenario is an absolute corker. Under the control of DirectX 9 we have about the 50% improvement over a single card that we used to see. It makes us wonder if the limitations of the extra performance in a dual card setup was related to the hardware or the DirectX itself. The more powerful versions of our cards on test, the HD6870 and the GTX460 1GB both just edge ahead of their stablemate. Let's see how they fair under DirectX 10.